Clinical History: A 56 year-old male presents with swelling and ecchymosis in the antecubital fossa following a “pop” and acute onset of pain while lifting a heavy weight one week earlier. What are the findings? What is your diagnosis? Coronal (1a) and axial (1b) STIR and sagittal T2-weighted (1c) images are provided. A coronal STIR image at the elbow demonstrates a partially bare distal half of the bicipital tuberosity (arrowheads) while the proximal bicipital tuberosity demonstrates attaching distal biceps tendon fibers (arrow). A coronal STIR image at the distal humerus demonstrates retracted and coiled tendon fibers (blue arrow) surrounded by edema medial to an intact musculotendinous junction along the lateral aspect of the distal biceps muscle (red arrow). The sagittal T2 FSE image on the left is centered over the course of the distal biceps tendon and demonstrates intact tendon fibers (red arrows) extending to the biceps tuberosity, but the fibers are too small to represent the entire distal biceps tendon suggesting that a portion of the tendon is absent at this level (arrowheads). The sagittal T2 FSE image on the right is slightly more medially positioned and redemonstrates retracted and thickened tendon fibers. Complete tear and retraction of the short head component of a bifurcated distal biceps tendon. Ruptures of the distal biceps tendon are seen most commonly in the dominant arm of males greater than 40 years of age and account for 3-10% of biceps injuries. The injury also affects athletes involved in strength training or who have sustained athletic related trauma. With increased understanding of the anatomy and biomechanics of the distal biceps tendon, surgeons are more likely to recreate the normal anatomy and restore supination and flexion at the elbow in patients who have sustained a distal biceps rupture. MRI is useful to delineate the extent of distal biceps tendon tears and retraction. In addition MRI provides information that helps differentiate other entities that may simulate distal biceps injury. The long head of the biceps arises from the supraglenoid tubercle and the short head of the biceps arises from the coracoid process. Cadaveric studies have shown that the long and short head muscles of the biceps have few muscular and distal tendinous connections1,2,3. The long and short head muscles interdigitate distally over a variable segment at the level of the distal musculotendinous junction, termed the “goose quill” because of its gross appearance to a goose’s feather3. Instead of a single cylindrical distal biceps tendon, in the majority of cases the distal biceps tendon is composed of two macroscopically distinct tendons with varying degrees of decussating tendon fibers1,2,3. The result is a distal biceps tendon that commonly consists of two independent units representing continuations of the proximal long and short head musculotendinous units of the biceps4. Proximally, the long (red) and short (blue) head tendons and muscles are oriented in the coronal plane and rotate 90 degrees externally into a sagittal plane at the distal insertion with the long head component positioned posterior to the short head component. This change in orientation results in a distal insertion of the tendon from the short head (blue) of the biceps muscle, and a proximal insertion of the tendon from the long head (red) of the biceps muscle on the bicipital tuberosity. The lacertus fibrosus arises at the distal myotendinous junction, encircles the flexor muscle group, and inserts into the proximal ulna. The distal tendon arising from the long head of the biceps muscle inserts onto the proximal bicipital tuberosity and the distal tendon of the short head inserts onto the distal portion of the bicipital tuberosity2. The insertional footprint of the short head is larger than the more proximal long head1,2. The short head footprint inserts over the apex of the bicipital tuberosity while the long head footprint lies more posterior with the result being a slightly oblique orientation of the entire footprint relative to the long axis of the radius5. Biomechanically, this footprint orientation results in the short head providing the greatest amount of flexion and supination force when the forearm is in pronation and neutral position5. When the forearm supinates past 60 degrees, the long head provides stronger supination torque based on the incompletely unwound slightly posterior position of the footprint5. The distal biceps tendon inserts at the extreme ulnar margin of the bicipital tuberosity and is ribbon-shaped just proximal to its insertion, but increases in width and length as it inserts on the tuberosity. The entire distal biceps footprint is slightly oblique to the long axis of the radius. The distally inserting short head component (blue) has a larger footprint and covers the apex of the bicipital tuberosity while the long head component (red) inserts on the proximal portion of the bicipital tuberosity in a more posterior location. The lacertus fibrosus (bicipital aponeurosis) arises at the level of the distal biceps myotendinous junction. Dissection studies are contradictory as to the exact origin. Athwal et al. found that the lacertus fibrosus originated from the short head tendon alone and felt that this was a consistent landmark to help the surgeon properly orient the torn distal biceps tendon at the time of repair2. Other studies indicate a shared origin from the short and long heads1,3. The lacertus fibrosus extends over the proximal flexor muscles and is tethered by several strong fascial adhesions before inserting at the ulnar aspect of the proximal ulna2. Fibers of the lacertus fibrosis also extend radial to the flexor muscles, the median nerve, and the brachial artery before inserting into the radial aspect of the proximal ulna1. The lacertus fibrosus functions to help protect the neurovascular structures, to aid in transmitting the biceps flexion force to the ulna, and with forearm muscle flexion may redirect the orientation of the biceps1. The bicipitoradial bursa is a synovial lined bursa consistently found between the distal biceps and bicipital tuberosity, and is normally collapsed and not visualized. The distended bursa can extend proximally and surround the distal biceps tendon1. The distal biceps tendon does not have a synovial lined tendon sheath. Axial images (Figure 7) are most helpful in evaluating the distal biceps with additional information supplied by orthogonal views. The FABS (flexed elbow, abducted shoulder, forearm supinated) view (Figure 8) has been advocated to improve imaging of the distal biceps insertion6. The normal tendon is low signal on all sequences. The normal distal biceps tendon may appear as a single tendon with an ovoid cross-section on axial images, as a partially bifurcated tendon with bridging fibers, or as two separate tendons. The bifurcated appearance is most easily identified in the proximal portion of the distal biceps tendon (Figure 9) and may persist to the insertion at the bicipital tuberosity, but more frequently the tendon fibers become inseparable by MRI more distally (Figure 10). The distal biceps tendon attachment to the bicipital tuberosity of the proximal radius is best demonstrated on axial images. A normal tendon (arrows) demonstrates low signal on T1-weighted (left) and fat-suppressed T2-weighted (right) images. FABS (flexed elbow, abducted shoulder, forearm supinated) view of the distal biceps tendon is felt to improve visualization of the distal biceps tendon because the tendon is unwound from the bicipital tuberosity due to the supinated position and the longitudinal view of the tendon without obliquity. T1-weighted axial (left) and coronal (right) images of the proximal portions of a bifurcated tendon. In this example the long (red arrow) and short (blue arrow) components are completely separated at this level. There may be varying degrees of bifurcation with the cleft partly or completely obscured by bridging fibers. The lacertus fibrosus is seen to arise from the short head component in this example (arrowheads). Fat-suppressed proton density-weighted (left) and T2-weighted (right) sagittal images that include the distal biceps demonstrated the normal fanned appearance as the tendon approaches the bicipital tuberosity. The distal biceps tendon on the left does not appear bifurcated (arrowheads), and the image on the right depicts a bifurcated distal biceps tendon with the short head (blue arrow) and long head (red arrow) components indicated. Distal biceps rupture most commonly affects the dominant arm of men from age 40 to 60. The mechanism of distal biceps tendon rupture is forced extension of the elbow held in 90 degrees flexion with the forearm supinated. Distal biceps tendon ruptures most commonly present after a single traumatic event. However, evidence suggests that tendon hypovascularity and mechanical impingement during forearm rotation are contributory factors, increasing tendon susceptibility to rupture7. Consequently, tendinosis and partial tears of the distal biceps tendon may precede complete ruptures. Smoking and anabolic steroid use may also increase the risk of distal biceps rupture8,9. Distal biceps tears in women are extremely rare and typically occur over the age of 60. The injury is most often a partial tear unrelated to a single traumatic event but with a more insidious onset10. Injuries of the distal musculotendinous junction with an intact distal tendon are exceedingly rare and most commonly occur with the elbow extended, the forearm supinated, and the glenohumeral joint in active or passive elevation11. In the classic clinical presentation of an acute complete biceps tendon rupture the patient relates a painful “pop” followed by swelling and ecchymosis in the antecubital region, asymmetry in biceps muscle contour, absence of a palpable distal tendon, and weakness and/or pain primarily in flexion and supination. The retracted distal biceps tendon leads to a palpable “mass” in the antecubital fossa. Frequently, the diagnosis of a complete distal biceps tear is not straightforward. In a study by Devereaux and ElMaraghy only 33% of patients described an audible or palpable “pop” and only 38% had a visible deformity with surgically proven complete distal biceps tears12. Swelling and hematoma can mask distal biceps muscle asymmetry despite a retracted tendon12. Retraction of the ruptured distal biceps tendon is prevented if the bicipital aponeurosis (lacertus fibrosus) remains intact, and in such cases the typical “mass” of retracted tendon in the antecubital fossa is absent. In addition, an intact lacertus fibrosus may limit ecchymosis formation by confining the hematoma13. With more chronic injuries (older than 4 weeks) edema and ecchymosis are often absent. Partial tears of the distal biceps tendon typically present with a more insidious onset with the patient complaining of chronic pain, often without significant loss of strength. Physical examination tests that can assist in diagnosing a complete distal biceps rupture include the hook test, the passive forearm pronation (PFP) test, and the biceps crease interval (BCI) test12. The hook test is performed by the examiner attempting to hook a finger posterior to the distal cord-like biceps tendon from the lateral side with the elbow held in 90 degrees of flexion and forearm supination. This can be accomplished with an intact distal biceps, but with a complete distal rupture there is no cord-like structure under which the examiner’s finger may be hooked14. An intact tendon but with a painful response to the hook test is indicative of a partial tear14. The PFP test evaluates the functional continuity of the distal muscle-tendon-bone complex15. With complete avulsion of the distal biceps tendon there is loss of visible and palpable proximal to distal movement of the distal biceps muscle belly with passive pronation of the forearm starting from a supinated position15. The BCI test evaluates the extent of tendon retraction associated with distal biceps rupture by measuring the distance between the antecubital crease of the elbow and the cusp of distal descent of the biceps muscle16. An abnormal BCI indicates a rupture of the distal biceps and lacertus fibrosus16. MRI allows characterization of distal biceps injuries that range from tendinosis to distal biceps tendon tear by demonstrating abnormalities of tendon diameter, tendon signal intensity, and tendon retraction. Tendinosis, partial tear, and complete rupture may affect a single distal biceps tendon and individual or both components of a bifurcated distal tendon. MRI findings of an acute complete distal biceps tendon rupture are best seen on fluid sensitive series and include discontinuity of the tendon at the insertion site with a fluid-signal filled gap, increased intratendinous signal intensity, and increased signal intensity in the biceps muscle belly and surrounding soft tissues (Figure 11). Ill-defined peritendinous fluid signal resulting from hemorrhage and edema is typically present with acute ruptures. An intact lacertus fibrosus may prevent significant retraction of the torn tendon and may make the differentiation of a complete rupture from a partial tear more difficult (Figure 12). 49 year-old male using a wrench and felt a pop one week prior. Axial fat-suppressed T2-weighted images at the level of the bicipital tuberosity (left) and at the humeral condyles (middle) demonstrates mild spurring at the volar and dorsal margins of the bicipital tuberosity (curved arrows) and absence of the inserting distal biceps tendon (arrowhead). More proximally, extensive edema is identified anterior to the brachialis muscle without visualization of the biceps tendon (asterisk) and tracking medially along the course of the lacertus fibrosus (short arrows) consistent with disruption of the lacertus fibrosus contributing to marked retraction of the ruptured distal biceps tendon. The retracted and lax distal biceps tendon (arrow) is identified on the sagittal fat-suppressed proton density-weighted image (right) surrounded by edema. 57 year-old male suffered a pulling injury with a “pop” 1 week prior. A sagittal STIR image (left) demonstrates a minimally retracted complete rupture of the distal biceps tendon (arrow) with peritendinous edema and hemorrhage (asterisk). The axial T1-weighted image (right) at the level of the elbow joint shows an intact lacertus fibrosus (arrowheads) arising from the biceps tendon (short arrow,) limiting tendon retraction. Partial tears of the biceps tendon are diagnosed by abnormal intra-tendinous fluid signal and alterations in tendon caliber (Figure 13). Avulsive marrow edema in the bicipital tuberosity and bicipitoradial bursitis are frequent accompanying findings17. With an improved understanding of the commonly bifurcated distal biceps tendon architecture, partial tears may be further described by the status of the distal short and long heads (Figure 13). What were once diagnosed as partial tears of the distal biceps tendon with longitudinal delamination or splitting were, in many instances, likely complete tears of an isolated component of a bifurcated distal biceps tendon as in the test case19. Using minimally invasive single incision repair techniques, such an injury may be missed because of the intact, taut remaining tendon19. The short head component is most commonly torn19 with variable involvement of the more proximally inserting component by tendinosis, partial tear, or complete tear3. Isolated tears of the long head component are less commonly seen. Sequential fat-suppressed T2-weighted axial images through a bifurcated distal biceps tendon from proximal (left) to distal (right) demonstrate the course of the long head (red arrow), which is posterior and inserts more proximally than the short head (blue arrow). In this case there is moderate tendinosis of the long biceps tendon at the insertion characterized by ill-defined increased intrinsic tendon signal. A partial tear of the short head is seen at its insertion with focal irregularity of the tendon contour and small foci of fluid signal at the tendon footprint with mild subjacent marrow edema (arrowhead). The MRI appearance of tendinosis is made on the basis of abnormal tendon diameter or increased tendon signal intensity that does not parallel fluid (Figure 14)3. The features of severe tendinosis may overlap with the appearance of low-grade partial tears18. 48 year-old male with elbow pain after lifting weights. Axial T1-weighted (left) and fat-suppressed T2-weighted (right) axial images through the bicipital tuberosity. Increased tendon signal but without fluid-signal intratendinous signal and increased tendon thickness (arrows) are consistent with moderate tendinosis. A small amount of fluid is seen in the bicipitoradial bursa (arrowhead). Bicipitoradial bursitis can present as a painful antecubital mass39. Bicipitoradial bursitis commonly accompanies partial tears of the distal biceps tendon. In the absence of underlying biceps tendon pathology, bicipitoradial bursitis is most commonly associated with overuse and repetitive mechanical trauma39. Bursal involvement by inflammatory processes such as rheumatoid arthritis and infection and by synovial metaplastic processes such as synovial osteochondromatosis may also be seen. 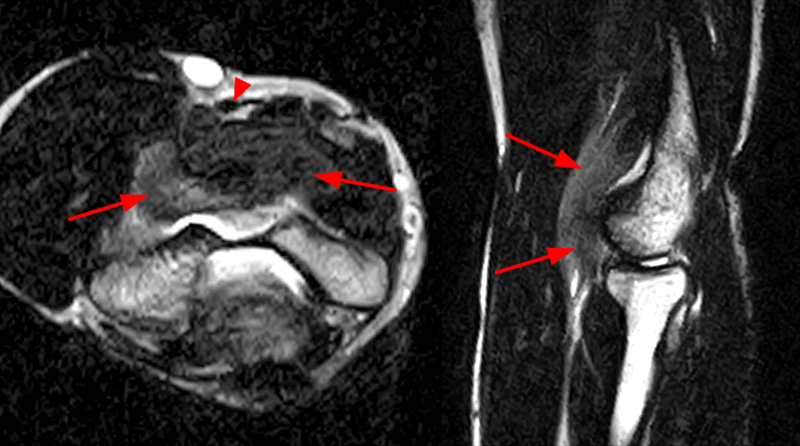 Distension of the bursa by simple or complex fluid, synovial proliferation, and synovial osteochondromatosis are readily demonstrated by MRI (Figure 15). Surrounding edema and synovial proliferation are more suggestive of an underlying inflammatory or infectious etiology. 70 year-old male with history of rheumatoid arthritis and mass in the antecubital region for 2 weeks. Axial (left) and sagittal (right) STIR images demonstrate a severe bicipitoradial bursitis (asterisks) with an intact distal biceps tendon (arrows). Brachialis muscle strains, like distal biceps tendon tears, often present following a similar mechanism of injury and may accompany distal biceps tendon rupture. Alternatively, brachialis muscle strains may be an isolated finding with an intact distal biceps (Figure 16). With the increasing popularity of climbing sports, including more specialized training, certain previously rare injuries are more commonly seen. Brachialis tendinitis results from prolonged elbow flexion and pronation typical of climbers and has been coined “climber’s elbow”. This mechanism may lead to brachialis tendinosis, muscle strains or even ruptures. 30 year-old male injured while lifting weights. Axial (left) and sagittal (right) T2-weighted images demonstrate increased signal within the distal brachialis muscle (arrows) deep to a normal distal biceps tendon (arrowhead) compatible with a muscle strain. Surgical repair of distal biceps rupture results in superior supination and flexion strength and pain relief compared to conservative management21. Early surgical repair is most desirable. Repairs done after 4 weeks from the time of injury may require use of a tendon graft because of muscle atrophy, loss of tendon length, and obliteration of the biceps tunnel22,23,24. Treatment of partial tears often begins conservatively with splinting, non-steroidal therapy, and physical therapy25. However, many of these patients will eventually require surgical repair for pain relief and to regain strength25. Repairing the distal biceps as closely as possible to its native footprint is important for optimal function. Biomechanical studies have shown that a repair that is too anterior to the footprint results in loss of supination torque between neutral and full supination of the forearm26. Failure to recognize the presence of separate bundles at the time of repair may result in incorrect placement of the short or long head, hindering the restoration of biceps function5. Several studies have shown that repair of the distal biceps tendon to its native footprint is much easier to accomplish by a posterior surgical approach27,28. However, a more recent technique utilizes a single anterior incision with transosseous sutures to reattach the distal biceps tendon to its normal footprint in order to maximize supination29. Initial attempts at reattachment of the torn distal biceps tendon to the bicipital tuberosity were performed through an anterior incision and resulted in a significant number of neurovascular complications30. Subsequent techniques attempted to more accurately restore the anatomic footprint by utilizing an anterior incision to retrieve the tendon and a posterior incision to reattach the tendon to the biceps tuberosity. These type repairs were met with an increased incidence of heterotopic bone (Figure 17) and proximal radioulnar synostosis resulting from partial stripping of the interosseous membrane and ulnar periosteum with dissection of the muscles off of the lateral aspect of the olecranon to gain exposure. Subsequent muscle-splitting techniques of the supinator and the common extensor muscle mass have significantly reduced the incidence of radioulnar synostosis when using a two incision approach30. Both single and double incision approaches are currently used. A recent randomized clinical trial demonstrated no significant differences in outcomes between single and double incision approaches with the exception being an approximate 10% greater flexion strength in the double incision group31. In addition, there was a significantly greater incidence of minor, transient complications such as transient neuropraxia of the lateral cutaneous nerve with the single incision approach31. A variety of fixation techniques are used for distal biceps tendon repair including transosseous sutures, suture anchors, cortical buttons, interference screws, and combinations of cortical button and interference screws32,33,34,35,36. An axial T1-weighted image (left) and sagittal STIR image (right) demonstrate severe heterotopic ossification (arrows) that was often associated with early double incision technique repairs. Evidence for dissection of muscle from the ulna is seen on the sagittal STIR series posteriorly with small suture artifacts abutting the posterior lateral ulna (arrowheads). Repair of the lacertus fibrosus has been shown to strengthen the distal biceps tendon repair, but at present there is no proof of improved clinical results following lacertus fibrosus repair38. The underlying brachial vessels and median nerve may be subjected to direct injury, such as laceration, and compression of the median nerve may occur with a tight repair38. Complications of surgical repair of the biceps tendon continue to include heterotopic ossification (Figure 18). Mechanical failure of the repair may occur with recurrent rupture or breakage or displacement of the fixation method. Poly-L-Lactide and other bioabsorbable interference screws commonly result in significant osteolysis and bone tunnel enlargement (Figure 19) but without significant correlation between the amount of osteolysis and functional and clinical outcomes37. Additional complications of bioabsorbable screws include foreign body reactions, which range from mild, self-limited reactions to severe, inflammatory responses including masses, collections, and the development of draining sinuses, which may mimic infection (Figure 20). Axial (left) and coronal (right) T1-weighted images following a single anterior incision repair demonstrate post-operative thickening of the distal biceps tendon (arrows) with a small adjacent focus of heterotopic ossification (arrowheads). AP and lateral radiographs demonstrate the enlarged osseous tunnel (arrowheads) typical of the osteolysis accompanying bioabsorbable interference screws. A small focus of heterotopic ossification is demonstrated volar to the radius on the lateral view (arrow). (20a) Sagittal STIR images of the same patient as in the figure 17 demonstrate a T2-hyperintense collection (arrowheads) tracking proximally from the intraosseous tunnel at the radial tuberosity containing linear and punctate material and debris. The intact distal biceps tendon (arrows) can be seen on the adjacent sagittal slice. (20b) Coronal proton density-weighted (left) and axial T1-weighted (right) images demonstrate the collection (arrowheads) containing debris located along the radial aspect of the distal biceps tendon (arrows) typical for a foreign body reaction. The patient responded well following debridement and the biceps repair was confirmed to be intact. The diagnosis of distal biceps tendon rupture may be difficult if tendon retraction is absent or if a partial rupture is present. The presence of a bifurcated distal biceps tendon may further complicate the clinical presentation when only one component is torn. MRI allows evaluation of the bifurcated distal biceps tendon and is able to assist in the differentiation of a complete from partial tendon ruptures. Following surgery, MRI allows assessment of tendon repair and identification of post-operative complications that may occur. Eames, M. H. A., Bain, G. I., Fogg, Q. A. & van Riet, R. P. Distal biceps tendon anatomy: a cadaveric study. J. Bone Joint Surg. Am. 89, 1044–1049 (2007). Athwal, G. S., Steinmann, S. P. & Rispoli, D. M. The Distal Biceps Tendon: Footprint and Relevant Clinical Anatomy. J. Hand Surg. Am. 32, 1225–1229 (2007). Dirim, B. et al. Terminal bifurcation of the biceps brachii muscle and tendon: anatomic considerations and clinical implications. AJR. Am. J. Roentgenol. 191, W248–55 (2008). Schmidt, C. C., Jarrett, C. D. & Brown, B. T. The distal biceps tendon. J. Hand Surg. Am. 38, 811–21; quiz 821 (2013). Jarrett, C. D. et al. Anatomic and biomechanical analysis of the short and long head components of the distal biceps tendon. J. Shoulder Elbow Surg. 21, 942–8 (2012). Seiler III, J., Parker, L., Chamberland, P., Sherbourne, G. & Carpenter, W. The distal biceps tendon: two potential mechanisms involved in its rupture: arterial supply and mechanical impingement. J. shoulder … 4, 149–156 (1995). Schneider, A., Bennett, J. M., O’Connor, D. P., Mehlhoff, T. & Bennett, J. B. Bilateral ruptures of the distal biceps brachii tendon. J. Shoulder Elbow Surg. 18, 804–7 (2009). Jockel, C. R., Mulieri, P. J., Belsky, M. R. & Leslie, B. M. Distal biceps tendon tears in women. J. Shoulder Elbow Surg. 19, 645–50 (2010). Schamblin, M. L. & Safran, M. R. Injury of the distal biceps at the musculotendinous junction. J. Shoulder Elb. Surg. 16, 208–212 (2007). Devereaux, M. W. & ElMaraghy, A. W. Improving the rapid and reliable diagnosis of complete distal biceps tendon rupture: a nuanced approach to the clinical examination. Am. J. Sports Med. 41, 1998–2004 (2013). Bain, G. I., Johnson, L. J. & Turner, P. C. Treatment of partial distal biceps tendon tears. Sports Med. Arthrosc. 16, 154–161 (2008). O’Driscoll, S. W., Goncalves, L. B. J. & Dietz, P. The hook test for distal biceps tendon avulsion. Am. J. Sports Med. 35, 1865–9 (2007). Harding, W. A new clinical test for avulsion of the insertion of the biceps tendon. Orthopedics 28, 27–29 (2005). ElMaraghy, A., Devereaux, M. & Tsoi, K. The biceps crease interval for diagnosing complete distal biceps tendon ruptures. Clin. Orthop. Relat. Res. 466, 2255–2262 (2008). Festa, A., Mulieri, P. J., Newman, J. S., Spitz, D. J. & Leslie, B. M. Effectiveness of magnetic resonance imaging in detecting partial and complete distal biceps tendon rupture. J. Hand Surg. Am. 35, 77–83 (2010). Williams, B. D. et al. Partial tears of the distal biceps tendon: MR appearance and associated clinical findings. Skeletal Radiol. 30, 560–564 (2001). Koulouris, G. et al. Bifid insertion of the distal biceps brachii tendon with isolated rupture: magnetic resonance findings. J. Shoulder Elbow Surg. 18, e22–5 (2009). Brigido, M. K., De Maeseneer, M. & Morag, Y. Distal biceps brachii. Semin. Musculoskelet. Radiol. 17, 20–7 (2013). Davison, B. L., Engber, W. D. & Tigert, L. J. Long term evaluation of repaired distal biceps brachii tendon ruptures. Clin. Orthop. Relat. Res. 186–191 (1996). Hallam, P. & Bain, G. I. Repair of chronic distal biceps tendon ruptures using autologous hamstring graft and the Endobutton. J. Shoulder Elb. Surg. 13, 648–651 (2004). Vardakas, D. G., Musgrave, D. S., Varitimidis, S. E., Goebel, F. & Sotereanos, D. G. Partial rupture of the distal biceps tendon. J. Shoulder Elb. Surg. 10, 377–379 (2001). Schmidt, C. C., Weir, D. M., Wong, A. S., Howard, M. & Miller, M. C. The effect of biceps reattachment site. J. Shoulder Elbow Surg. 19, 1157–65 (2010). Hansen, G. et al. Anatomic repair of the distal biceps tendon cannot be consistently performed through a classic single-incision suture anchor technique. J. Shoulder Elbow Surg. 23, 1898–1904 (2014). Forthman, C. L., Zimmerman, R. M., Sullivan, M. J. & Gabel, G. T. Cross-sectional anatomy of the bicipital tuberosity and biceps brachii tendon insertion: relevance to anatomic tendon repair. J. Shoulder Elbow Surg. 17, 522–6 (2008). Tanner, C., Johnson, T., Muradov, P. & Husak, L. Single incision power optimizing cost-effective (SPOC) distal biceps repair. J. Shoulder Elbow Surg. 22, 305–11 (2013). John, C. K., Field, L. D., Weiss, K. S. & Savoie, F. H. Single-incision repair of acute distal biceps ruptures by use of suture anchors. J. Shoulder Elbow Surg. 16, 78–83 (2007). Urgery, S. et al. Single Versus Double-Incision Technique for the Repair of Acute Distal Biceps Tendon Ruptures. 1166–1174 (2012). Heinzelmann, A. D., Savoie, F. H., Ramsey, J. R., Field, L. D. & Mazzocca, A. D. A combined technique for distal biceps repair using a soft tissue button and biotenodesis interference screw. Am. J. Sports Med. 37, 989–94 (2009). Hartman, M. W., Merten, S. M. & Steinmann, S. P. Mini-open 2-incision technique for repair of distal biceps tendon ruptures. J. Shoulder Elbow Surg. 16, 616–20 (2007). Weinstein, D. M. et al. Elbow function after repair of the distal biceps brachii tendon with a two-incision approach. J. Shoulder Elbow Surg. 17, 82S–86S (2008). Peeters, T. et al. Functional outcome after repair of distal biceps tendon ruptures using the endobutton technique. J. Shoulder Elb. Surg. 18, 283–287 (2009). Khan, A. D. et al. Repair of distal biceps tendon ruptures using suture anchors through a single anterior incision. Arthroscopy 24, 39–45 (2008). Landa, J., Bhandari, S., Strauss, E. J., Walker, P. S. & Meislin, R. J. The effect of repair of the lacertus fibrosus on distal biceps tendon repairs: a biomechanical, functional, and anatomic study. Am. J. Sports Med. 37, 120–3 (2009). Potapov, A., Laflamme, Y. G., Gagnon, S., Canet, F. & Rouleau, D. M. Progressive osteolysis of the radius after distal biceps tendon repair with the bioabsorbable screw. J. Shoulder Elbow Surg. 20, 819–26 (2011).